In this six hour PBS series, Harvard psychologist Daniel Gilbert takes us through much of modern psychology. The first of the 3 shows is about relationships, starting with infant attachment and moving onto adult relationships. The second looks at negative emotions and mental disorders. The third looks at the nature of happiness. Gilbert co-wrote each of the three shows, and he is present on the screen a fair deal of the time, as well as narrating in voice-over. The documentary pulls out nearly all the stops in trying to engage the viewer. It tells personal stories of people dealing with psychological problems, interviewing them and following them through struggles, with evocative music in the background. It has plenty of celebrities talking about their own lives -- including Alanis Morissette, John McEnroe, Chevy Chase, and Larry David. They reveal a bit more about themselves than we usually see, and this makes their contributions more interesting. We also see some prominent psychologists talking about their work, and this is especially interesting for those who know these people's work but have not seen them. Gilbert himself appears in unusual locations such as Grand Central Station when explaining the basic ideas. This was an enjoyable introduction to psychology, but not particularly memorable. There is so much human interest here that it drowns out the science. One might expect that the website for the show would have more science to back up the show, but it is pretty minimal. The other factor is that that Gilbert is an unassuming and mild mannered host, but that's not really what you want to hold your attention. We don't see much of what makes him a Harvard professor: mostly he says little and looks empathetic. It makes one yearn for a more charismatic host like Alan Alda, or a more scholarly host who gives more information. There will be segments of this show that will be useful to psychology teachers, and with the ability to select scenes, one can show just the relevant parts. 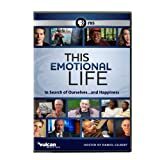 Viewers who are unfamiliar with psychology may well find the whole series interesting, but most people will find at least some segments that are worth watching. You have to watch the whole thing to find the best parts, since there is no detailed guide on the DVD box or the website to the different parts.